One thing you should add to your bucket list is shark cage diving. There are tons of things you have to do during your stay in Cape Town and South Africa. Visit the Winelands, go to Robben Island, climb Table Mountain and many more that make this part of the world so unrivalled. One thing you should add to this list is shark cage diving. There are a few places in the world where you can see face to face with the great white shark in such an impressive way. And to be honest, I didn’t even think about doing shark cage diving here in South Africa at first. You may know the video of the shark coming into the cage that went viral on Facebook. Yeah. That was my main reason not to go. Maybe a little bit exaggerated because something like this normally never happens. But still, I was super afraid to go. Our adventure started at 12 in the afternoon in Gansbaai, so we got lunch during an extensive briefing about safety, the cage and the do’s and don’ts about diving with sharks. There is always the possibility to ask further questions, so ask as many questions as you want! And then it is time to go on board! Depending on where you plan to dive, the trip to the destination will take around 20 minutes. On the boat everybody puts on their wet suit. If the sea is rough, it can be a stormy ride. So if you are susceptible to sea sickness, take medication in advance. Once at the destination, the anchor and the cage are hoisted into the water. The adventure can begin! I remember that I was the most nervous at this point. 8 of us entered the cage at the same time, kitted with thick wet suits including boots and a pair of goggles. Those who had to wait for their turn, climbed the deck to view the spectacle from above. Although it is not the same close-up of the shark as you get in the cage, it is nevertheless impressive. I entered the cage second and I was so nervous. The first group already saw 2 sharks, so we knew that they were still around. Once in the cage my fear was all gone. The only thing I could think about was how it would be to see the top-predator of the ocean. In the cage it is a matter of hanging and waiting for the crew to call ‘GET DOWN!’. Then you know that a shark is coming your way, because of the bait that is being held by the crew. The bait is in the form of tuna or another fish head. Every time I heard them call, I got so much adrenaline through my body. And there you float, face to face with one of the most terrifying animals you have ever seen. And although you are 100% safe in the cage, it remains a unique, exciting and scary experience. At the end I think the cold water was more shocking than seeing the sharks up close. 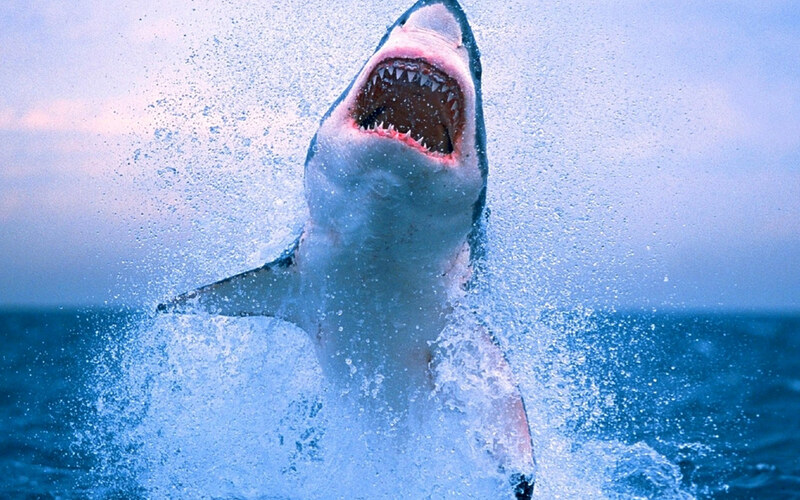 You probably got super excited and want to face the great white shark as well right? Since there are limited spots in peak season, it is highly recommended to book ahead of time. For more information and prices of shark cage diving with Marine Dynamics, send an e-mail to book@onceincapetown.co.za or ask reception.